This sample shows how Paris can be used in the city, county, state and federal government sectors to produce complex and expensive documents, such as county jury summons letters, on plain paper. Ideal for critical high-volume applications such as jury summons which must be produced and mailed in very narrow time frames and which contain very critical and detailed information. Print in duplex to include terms and instructions on the reverse. Make changes easily and quickly without wasting money on redundant pre-printed stock. Use Paris conditional processing to highlight crucial results for attention and barcodes for return processing. Apply mail processing to generate significant mail discounts. 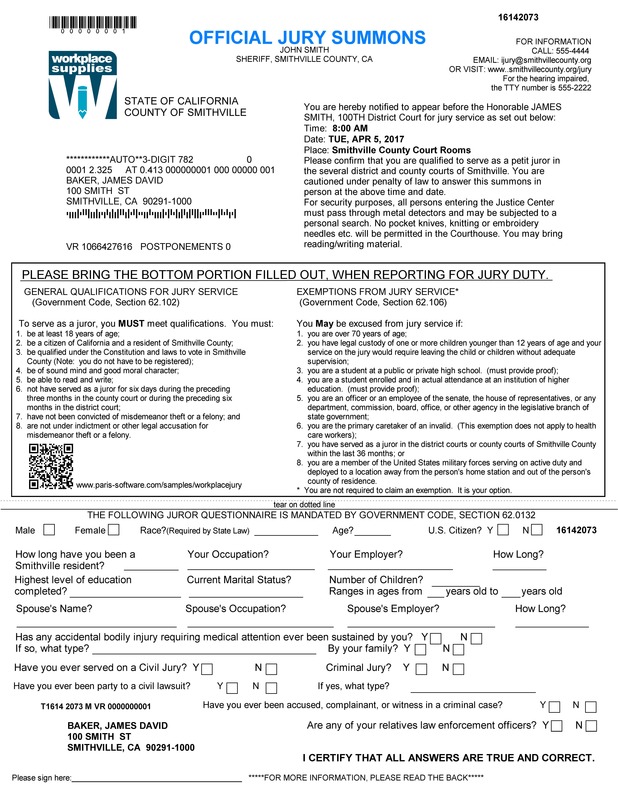 In this example, we are have re-designed a county jury summons form in Paris and then used it to print on plain paper. No changes are required to your host system or process. Generate electronic PDF copies for filing and for electronic delivery.